Summer magazine 2015: Is academic freedom being eroded? What is the state of academic freedom in 2015? 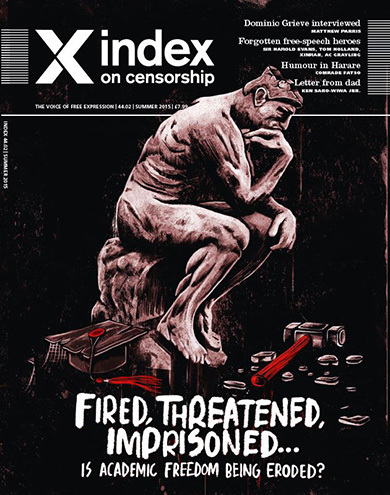 Index on Censorship magazine’s summer 2015 issue takes a global vantage point to explore all the current threats – governmental, economic and social – faced by students, teachers and academics. In the UK and US, offence and extremism are being used to shut down debates, prompting the adoption of “no-platforming” and “trigger-warnings”. In Turkey, an exam question relating to the Kurdish movement led to death threats for one historian. In Ireland, there are concerns over the restraints of corporate-sponsored research. In Mexico, students are being abducted and protests quashed. Plus we have reports on Ukraine, China and Belarus, on how education is expected to toe an official line. Also in this issue: Sir Harold Evans, AC Grayling, Tom Holland and Xinran present their free-speech heroes. Ken Saro-Wiwa Junior introduces a previously unpublished letter from his activist father, 20 years after he was executed by the Nigerian state, and Raymond Joseph reports on the dangers faced by Africa’s environmental journalists today. Comedian Samm Farai Monro, aka Comrade Fatso, looks at the rise of Zimbabwean satire; Matthew Parris interviews former UK attorney general Dominic Grieve; Italian journalist Cristina Marconi speaks to Marina Litvinienko, wife of the murdered KGB agent Alexander; and Konstanty Gebert looks at why the Polish Catholic church is upset by Winnie the Pooh and his non-specific gender. Our culture section presents exclusive new short stories by exiled writers Hamid Ismailov (Uzbekistan) and Ak Welaspar (Turkmenistan), and poetry by Musa Okwonga and Angolan journalist Rafael Marques de Morais. Plus there’s artwork from Martin Rowson, Bangladeshi cartoonist Tanmoy and Eva Bee, and a cover by Ben Jennings. 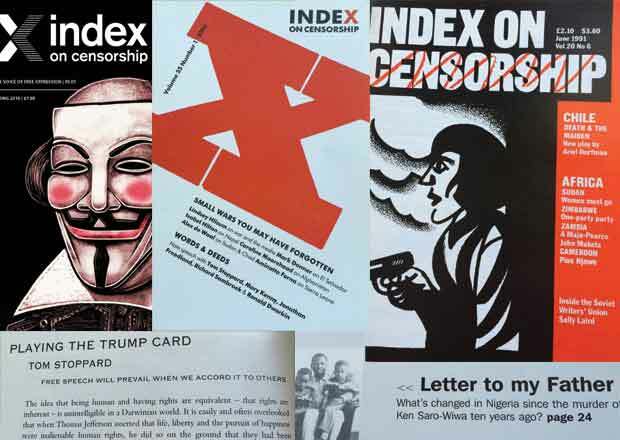 Index on Censorship magazine was started in 1972 and remains the only global magazine dedicated to free expression. Past contributors include Samuel Beckett, Gabriel García Marquéz, Nadine Gordimer, Arthur Miller, Salman Rushdie, Margaret Atwood, and many more. In print or online. Order a print edition here or take out a digital subscription via Exact Editions. Copies are also available at the BFI, the Serpentine Gallery, MagCulture, (London), News from Nowhere (Liverpool), Home (Manchester), Calton Books (Glasgow) and on Amazon. Each magazine sale helps Index on Censorship continue its fight for free expression worldwide.